"As you've seen, today we've released our unclassified assessment detailing with high confidence that the Syrian regime carried out a chemical weapons attack that killed well over a thousand people, including hundreds of children," Obama said. The president said the use of the deadly weapons had violated international "norms" and that action was needed to prevent the further use of the arms. A future military operation would not involve troops on the ground as part of a long-term campaign, Obama said. "But we are looking at the possibility of a limited, narrow act that would help make sure that not only Syria but others around the world understands that the international community cares about maintaining this chemical weapons ban and norm," he said. The White House on Friday released an intelligence assessment that concluded with "high confidence" the Bashar al-Assad regime conducted a deadly poison gas attack using a nerve agent. It stated, "Our high confidence assessment is the strongest position that the U.S. intelligence community can take short of confirmation." The costs of planned Syria strikes using cruise missile ships currently deployed in the Eastern Mediterranean were not disclosed by Defense Secretary Chuck Hagel, Adm. James Winnefeld, vice chairman of the Joint Chiefs of Staff, and several other high-ranking administration officials during a telephone briefing Thursday night for congressional leaders. However, estimates of the limited-duration strike are expected to be in the hundreds of millions of dollars. "The secretary indicated that the administration would consult with Congress on the cost of exercising a potential military option, but specific dollar amounts weren't discussed," a senior defense official when asked about the funding shortfalls. Gen. Martin Dempsey, chairman of the Joint Chiefs of Staff, stated in a July 19 letter to the Senate Armed Services Committee, that larger-scale military operations would cost hundreds of millions or billions, depending on the number of forces and the duration of the operations. For example, training and assisting Syrian opposition forces would cost $500 million annually and "limited" standoff missile and air strikes would cost in the "billions." Operating a no-fly zone would cost about $1 billion per month, and the cost of using special operations forces to control chemical weapons would be "over" $1 billion monthly. A congressional aide familiar with the congressional leaders’ briefing said Hagel and Winnefeld made clear the Pentagon would need to "work" with Congress to obtain supplemental funding for Syria attacks. "Good luck with that," the aide said, reflecting widespread concern among congressional Republicans with the Obama administration’s defense cuts. The Pentagon leaders said unlike the 2011 military operations against Libya, there are not enough operating funds to conduct the attack on Syria. The administration during the first term cut $487 billion from defense spending and another $55 billion under congressional sequestration legislation. An additional $55 billion is slated to be cut next year. Last April, under questioning from Rep. Mike Conaway (R., Texas) at a House Armed Services Committee hearing April 11, Hagel said that if U.S. military action is taking in Syria "it's pretty clear that a supplemental would be required." Dempsey said during the same hearing that "It would take a supplemental" funding for a Syria operation. Several Republican leaders expressed skepticism that the briefing failed to outline key military options and objectives. House Armed Services Committee Chairman Rep. Howard P. "Buck" McKeon (R., Calif.), asked the administration officials to specify target sets and objectives and the officials did not do so. At one point in the 90-minute briefing, Secretary of State John Kerry said the main objective of a military strike was to "deter" the further use of chemical weapons. A senior Republican aide said Obama is a "fire and forget" commander-in-chief who did not provide information to the American people on the surge in Afghanistan and ordered operations in Libya that "turned North Africa into a safe haven for terrorists." Kerry, meanwhile, made an impassioned appeal for taking retaliatory action against Syria for the use of chemical arms. "Our concern with the cause of the defenseless people of Syria is about choices that will directly affect our role in the world and our interests in the world," he said during a speech at the State Department. Kerry said "thousands" of sources provided evidence linking the Assad regime to the Aug. 21 attack. Kerry said the intelligence shows the regime sought to attack opposition rebels in the Damascus suburbs and that three days before the attack "chemical weapons personnel were on the ground, in the area, making preparations." "And we know that the Syrian regime elements were told to prepare for the attack by putting on gas masks and taking precautions associated with chemical weapons," he said. "We know that these were specific instructions." Also, the location and time of launch of chemical rockets and where they landed is known and that they were fired from regime controlled areas and were fired only in "opposition-controlled or contested neighborhoods." The chemical arms attacks also were widely discussed on social media within 90 minutes of the early morning strikes on 11 sites in the Damascus suburbs. The reports included images of people choking or dying, he said. A total of 1,429 people were killed including 426 children, Kerry said. "This is the indiscriminate, inconceivable horror of chemical weapons. 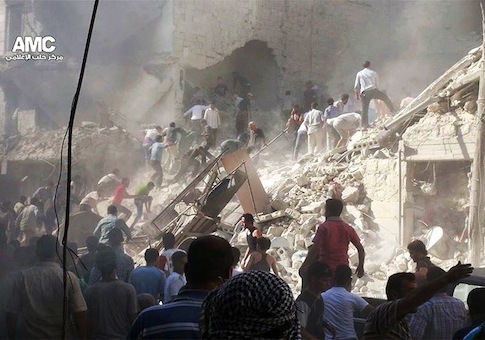 This is what Assad did to his own people," he said. Additional evidence obtained by U.S. intelligence includes details after the attack that a senior Syrian government knew about the attack and "confirmed that chemical weapons were used by the regime" and discussed the impact and expressed fears the use of the arms would be discovered. Kerry said Syrian military forces fired artillery shells into the affected area to "destroy evidence" by heavy bombardment at four times normal rates of fire than in the previous 10 days. United Nations inspectors’ access also was impeded and controlled, he said. "Our intelligence community has carefully reviewed and re-reviewed information regarding this attack," Kerry said. "And I will tell you it has done so more than mindful of the Iraq experience. We will not repeat that moment." The intelligence report stated that it was based on human, electronic, and imagery sources that reveal chemical rocket attacks were carried out Aug. 21 against regime opponents in the Damascus suburbs. "The body of information used to make this assessment includes intelligence pertaining to the regime’s preparations for this attack and its means of delivery, multiple streams of intelligence about the attack itself and its effect, our post-attack observations, and the differences between the capabilities of the regime and the opposition," the report said. It concluded that Syrian rebels did not carry out the attack. The nerve agent used was not identified, but the report said Syria stockpiles the blistering agent mustard and nerve agents sarin and VX. Regime "frustration" with the military’s failure to suppress several Damascus suburbs of opposition forces was the reason the chemical attack was carried out, the report said. Three days before the attack, there were indications of the likely use of the chemical arms, it stated. Preparations included Syrian military personnel mixing chemical weapons from Aug. 18, including sarin. "We have a body of information, including past Syrian practice, that leads us to conclude that regime officials were witting of and directed the attack on August 21," the report said. "We intercepted communications involving a senior official intimately familiar with the offensive who confirmed that chemical weapons were used by the regime on August 21 and was concerned with the U.N. inspectors obtaining evidence." By the afternoon of Aug. 21, Syrian chemical weapons troops were ordered to cease operations, and the regime stepped up artillery attacks on the neighborhoods where the weapons were used. The stepped up shelling continued until Aug. 26. This entry was posted in National Security and tagged Chuck Hagel, John Kerry, Middle East, Syria. Bookmark the permalink.